Thirty-two, but with the short-cropped hair and stubble mustache of a fresh police recruit, Adam is what’s known in local news as a stringer: the photographers and videographers that cruise the city documenting accidents, crimes, disasters of all sizes in the hopes of selling their footage to media outlets faster than their competitors. His black tactical jacket and safety vest are partly inspired by a former obsession with airsoft guns, while the big velcro PRESS patches adorning them are ripped from the playbook of Scott Lane, the LA stringer documented in the Netflix series Shot in the Dark. (Of the three companies featured in a show described by reviewers as “sleazy”, “tasteless”, “undiluted rubbernecking”, Lane’s LoudLabs is presented as the most morally bankrupt.) 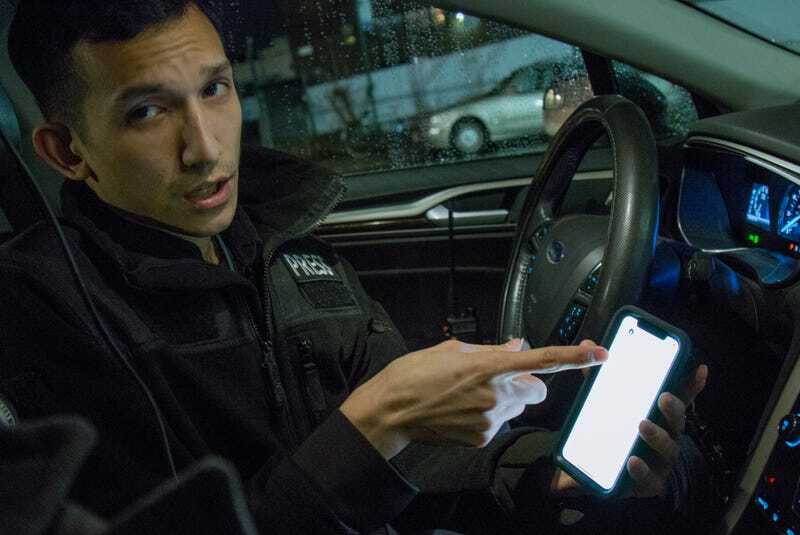 New York City doesn’t have any stringer companies yet, but that’s what Adam—who asked us not to use his last name in this article and goes by the moniker Adam West on social media—has been working on for the past two months with NYC911News. Inside his dark grey Ford Fusion is a utility belt of tools: two smartphones clipped above the car’s sat-nav and three dispatch radios running up to an antenna jutting out of the sunroof to increase their range, tuned to the frequencies of the FDNY, NYPD Special Operations Division (SOD), and the third swapping constantly to local precincts, the codes for which Adam has memorized. One phone displays incidents reported to the Citizen app while the other chirps out Twitter alerts from select accounts and tips through a Whatsapp group run by a Daily News photographer. The effect is overwhelming. Driving most days for Uber, Lyft, Juno, and Via, he’s grown used to being the servant of many masters. “When we decide to go to a [stringer] job we’re assuming the risk that we may not get paid. Whereas when I answer an Uber job and I press ‘accept trip’ I know I’m getting something. There’s no guarantee of how much, but there’s a guarantee of something,” he says. With its gadgets and metal push bumpers, passengers routinely mistake his Fusion for a cop car. The only difference with riders in his car is that Adam sends the audio from SOD into an Secret Service-style earpiece, filming between trips if proximity and opportunity align. Car collided with tree in Elmhurst. At 98th and 23rd the front end of the white Nissan is mutilated. Adam pulls his camera and shoulder rig out of the trunk and goes to film. No pin, and no passengers. An eyewitness claims two people fled the car on foot after it crashed, but neither he nor the cops seem to know why. Adam shoots 30 seconds of footage from a few angles and we find another staging area to idle in—someplace near a highway and a Link NYC public wi-fi terminal so he can upload the footage to Google Drive. We end up in front of the Quays, a local Irish bar in Astoria. All the footage from an event becomes a package, and a good package can net $100 to $300 per hit. Get a few outlets to buy it and that can easily become $1,000 per job. The ruined Nissan probably won’t sell, but Adam uploads it anyway, shooting an email off to New York 1, CBS, Pix 11, and a dozen other stations, agonizing over whether midnight should be referred to as Saturday night or Sunday morning. Certain events are more likely to be bought than others. Pinjobs and overturned vehicles, water main breaks, fires, slashing victims, pedestrians struck cars or trains, suicidal individuals on ledges (before or after jumping), people who have barricaded themselves inside structures, preferably with hostages. “If it’s just another guy shot in the Bronx, it’s not gonna make the news. If it’s a teenager, if it’s a child, if it’s a baby shot, that kind of stuff—or multiple people shot,” he says, “That’s what they want.” Still, most happenings are ordinary and not worth the gas to film. A collision can be a simple fender-bender. A severed limb can mean a finger. Despite the idiom, where there’s smoke, there is not necessarily fire. Reports of burglars breaking in through the roof of an apartment building turn out to be the sound of rain. The radio crackles again. It’s too far, so he records the string of information as a voice message when the SOD dispatcher repeats it, passing the tip to the 10 or so members of the NYC911News Whatsapp group, who, like Adam, all have some secondary line of work: a DJ, a real estate agent, a bike messenger, and a conservationist to name a few. There’s strength in numbers. “Let’s say I’m in Bay Ridge and my guy’s in the Bronx and there’s a 2-alarm fire. By the time I get to that 2-alarm fire, that fire’s gonna be out,” he explains. “He can get there, catch the flames, catch the victims being loaded on the ambulance. And if that sells for say, 500 bucks? Multiple stations? At least I’m getting a quarter of that, whereas [if] he was a random stringer, I’d be getting nothing.” In exchange for his cut, Adam handles pitching, vendor accounts, and the other nuts and bolts of NYC911News. As small a community as New York City stringers are, a young and informal an operation like NYC911News is still vulnerable. “A lot of these guys, I notice, are older. When they get a solid staff job at a newspaper like the Daily News or the New York Post they stick with it and they do not quit,” he tells me, “The young guys you might see might be Stringr app users, they might be new grads working at NY1 or channel 12.” While he feels photographers are different enough from videographers like himself, app-based paid platforms like Stringr and unpaid ones like Citizen eat away at his profits. “At some point I would tell people ‘Hey is that Citizen? Can you stop filming? You’re costing me money,’” though his new approach is to try to recruit videographers using these apps with the promise of better pay. At some point during the evening it becomes clear he uses Stringr too—but passes on the job because it’s in Jersey City. Man being arrested outside the Buccaneer Diner. After a false start chasing a reported assault on the Grand Central Parkway, Adam hears a local precinct responding to an unconfirmed fight: ten people brawling with knives. We arrive at 93rd and Astoria Boulevard in time to watch over a dozen officers lead a single angry man out of the 24-hour Buccaneer Diner into one of the eight cars that responded to the call, no knives in sight. “I love these perp walks,” Adam laughs, reviewing the footage. It probably won’t sell either but, “it’s probably gonna make good social media stuff.” Whether or not news outlets buy his footage, he can still make a little extra by uploading it to YouTube. His most successful stringer clip—HUGE VIOLENT Fight! Brooklyn halal food cart attacked! Feat. on Pix11 & NYPost—is riddled with comments attributing the violent behavior to the attackers’ race, though the commenters are undecided on what race that might be. Much of his expertise with “buffing”—listening in on scanners—comes from years as an EMT for an ambulance company in his neighborhood of Bay Ridge, eavesdropping on 911 reports to swoop in before city ambulances arrive. It’s a controversial practice, but contained at least the veneer of assisting people in need. “In EMS we had a cool phrase: ‘I don’t want anything bad to happen to you, but I want to be there when it does.’ What do we say? We don’t have a cool saying like that,” he tells me in a moment of reflection. “Coming from EMS to this job is very almost… awkward. As an EMT, I work with fire, I work with police, we work together. There’s that camaraderie. Bond. Whatever. Now I go to this job, now I’m like, the schmuck with the camera trying to film the victim.” On the rare occasion he works EMS these days, the promising calamities that come over dispatch get passed to his Whatsapp groups. Police ESU responding to crashed vehicle near FDR Drive. By 4am the rain is starting to pick up, and exhausted drivers start making mistakes. There’s been a crash on the onramp to the southbound FDR. An Emergency Service Unit is looping chains under the rear axle of a van, preparing to pull it off the concrete barricade its beached itself onto. The passengers are nowhere in sight. Documenting even this bloodless wreckage feels grotesque but I’m beginning to understand why adrenaline junkies like Adam are drawn to it. By five, the night is looking like a washout. Before we head back to Brooklyn where Adam would drop me and my soggy gear off on his way down to Bay Ridge, we idle near a 7-11, waiting for jobs from the now-dwindling radio messages. Adam dabs some hand sanitizer into his palms, tucks into a prepackaged croissant and a coffee, and plays me some of the clips he’s shot. A massive car collision. Then a woman being carried out of a ruined cab. Then a three-alarm fire where firefighters slice into the security gates of a building with massive saws—he caught that one at the tail end of an overnight shift on the way home and shot for close to an hour without a smoke mask. He perks up at the sound of sirens behind us. The ambulance passes with the words “senior care.” Old people dying isn’t news, it’s just life. He goes back to his croissant and coffee.